Did you know there are around 4,000 tendons in the human body? These fibrous, connective tissues are made of collagen and attach your muscles to your bones, allowing the fascinatingly complex machine we call the human body to walk, run, dance, and play—fluidly and precisely. Out of all those tendons, your Achilles, which attaches leg and foot muscles to the heel bone, is the thickest and strongest. It’s designed to withstand the incredible wear and punishment you put on your feet and legs every day. However, even the mighty Achilles is vulnerable to aches and strains. When a tendon is damaged or injured, it’s called tendinopathy—Greek for, roughly, “suffering of the tendon.” There are two main types of Achilles tendinopathy: Achilles tendinitis and Achilles tendinosis. 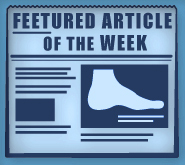 Although perhaps much more commonly known to the general public, Achilles tendinitis in the strictest sense is actually the rarer of the two. The term simply refers to inflammation of the tendon. It can result from a specific injury or from overuse, and overall is more likely to be acute. It is more common in people who have other foot, leg, and joint conditions that can put extra stress on the tendon—flat feet and arthritis, for example, or who don’t take time to properly stretch before engaging in vigorous activity. By contrast, Achilles tendinosis is a term used to describe tiny micro-tears in connective tissues that lead to degradation of the cells—in other words, the tendon itself changes. Overuse is usually the cause here, especially if you play lots of stop-and-go sports like tennis. Whereas tendinitis is more associated with an acute, inflammatory response to an injury, tendinosis is more associated with a chronic condition and may not be inflammatory. Because the symptoms of two conditions are so similar—pain, swelling, decreased range of motion—they are often confused for one another. Even medical professionals may use “tendinitis” as an umbrella term to refer to both types of Achilles tendinopathy. Because each condition has a unique cause, however, they can vary a bit in terms of treatment and recovery time. It is true that, in either case, the initial treatment is fairly standard—get off your feet as soon and as often as you can, rest, and use ice on the area three or four times per day. Custom orthotics may be able to correct any abnormalities in your foot or walking gait that lead to the damage in the first place. We may prescribe anti-inflammatory medication to help, especially if it’s tendinitis rather than tendinosis. Since Achilles tendinosis is more associated with chronic conditions and involves actual structural changes to the tendon itself, it’s a little bit tougher to treat and can take much longer to heal completely—weeks to months, rather than days or weeks. More advanced (although still conservative) care like stretching, massage, and physical therapy may be especially helpful in cases of tendinosis, though it can be effective for both types of tendinopathy. If you’re experiencing tendon pain, call Dr. Michael Stein and Zeindelin Ahmad, DMP of Foot Doctor of the East Bay today. We are the experts and will carefully examine your feet and ankles, including a complete physical examination and X-rays if needed, to determine if you have any other complications such as bone spurs or Haglund’s deformity. Let’s get your Achilles working again so you can go back to the things you love. Reach us in San Leandro, CA, at (510) 483-3390; Pleasanton, CA, at (925) 425-9684, or Los Gatos, CA, at (408) 356-6767.